I made the 123 sourdough from my starter the other day. I was amazed and pleased at how this loaf came together. I don't think I put enough salt in it though, and its not really "sour." but the starter culture is really vigorous and active, and it is more sour than last time. I started with 9 oz of starter, 18 of water and 27 of flour, and made two nice loaves. The crust is thick and chewy, and the crumb is moist, but has small even holes. No picture of crumb. I made the dough and kneaded with my mixer for 4-5 minutes, then did a few stretch and folds (2 sets 45 minutes apart) and then let it ferment overnight. The next morning it was overflowing the bowl! I shaped it cold and let it rise; it doubled in size, but that was mostly width, they were very flat. They had good surface tension though; when I cut them, they split right open. And, I was amazed at the oven spring; it rose quite high on the stone. 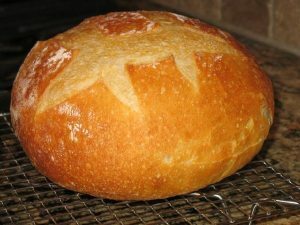 I baked at 500 °F for 2-3 minutes with steam (3/4-1 cup hot water in a pan) and reduced temp to 450 for about 40 minutes. The color is great! I am very happy with this loaf. This loaf had a lot of crackling, which I've never seen before. Is this normal? what causes it? Many of us wish a crackly crust were "normal!" It's neither good nor bad intrinsically, but is generally regarded as an indication of a well-baked hearth loaf. The crackling is caused by the contraction of the loaf as it cools, if the crust is dry and hard enough so that 1) it cannot contract without fracturing and 2) it forms a barrier to moisture from the crumb migrating to the surface and softening the crust. Very nice looking breads! To have crackling loaves especially with such nice golden colors is a sign of well baked loaves. Good job. I love it when they crackle! I have been meaning to post and you just prompted me. I made the 1-2-3 formula 4 days in a row. I added 2 T honey, 1 cup golden raisins and 1 cup toasted walnuts with a handful of flax seeds. Everyone who ate it, loved it so much, that I just kept baking the same for 3 consecutive days for different occasions. I also made the 1-2-3 recipe adding about 2 T olive oil and a couple of small twigs of fresh rosemary. chopped. The result was very good again. I just love this simple formula. Thanks Flo! Crumb shots: Need work on my photos! When I refresh the starter I use 1:1:1, so I think that means it's 100%? Its pretty wet; it is not dry enough to be a dough, it is like thick pancake batter. 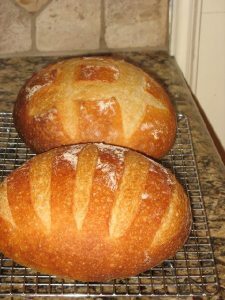 I followed the rye starter recipe on this site.